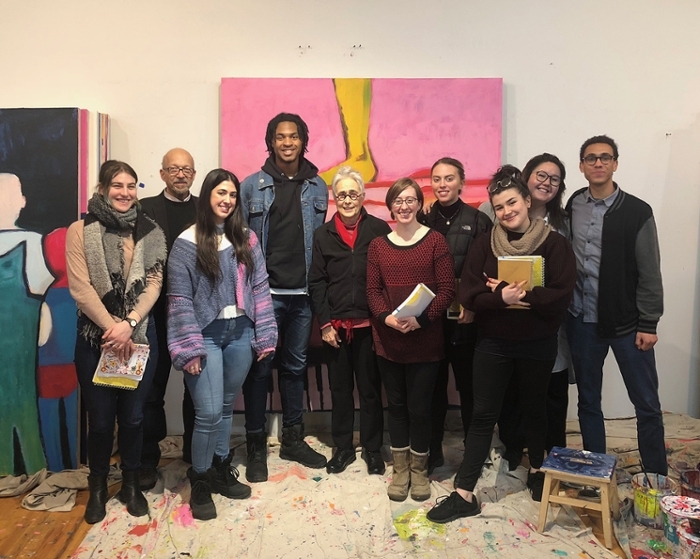 A. LeRoy Greason Professor of Art Mark Wethli took a group of eight students to New York City for the weekend earlier this month, to enjoy some of the artistic offerings of the Big Apple—taking in galleries, museums, and artist studios. 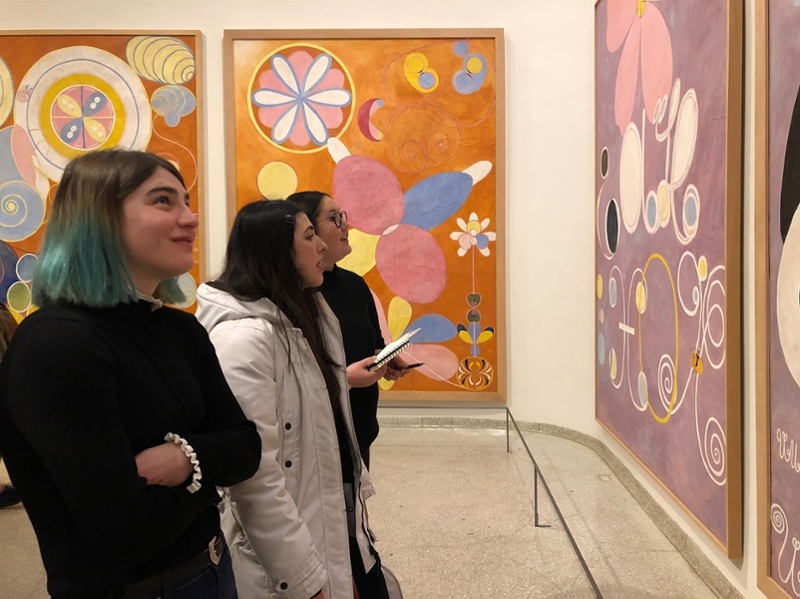 The trip included a visit to the Brooklyn studio of the acclaimed figurative painter Katherine Bradford, as well as an excursion to the Guggenheim Museum to check out the first major solo exhibition of the work of pioneering abstract artist Hilma af Klint, plus other stops around the city. The group—most of them visual arts majors—got the chance to do some networking and meet with a number of Bowdoin alums working as artists in the city. One notable highlight was a visit to the ADAA Art Show (Art Dealers Association of America), where they met halley k harrisburg ’90, director of the influential Michael Rosenfeld Gallery and a generous patron of visual arts at Bowdoin. The students were treated to a gallery talk at the P.P.O.W. Gallery in Chelsea, which specializes in contemporary art. The talk was given by Ella Blanchon ’16, who works there as a gallery associate. They also visited the graduate studio of Nick Benfey ’15, who’s pursuing an MFA at Hunter College. The road trip back to Maine was also a memorable one, as the group stopped at North Adams, Massachusetts, to check out the MASS MoCA.